Autumn is well and truly here. This means one thing and one thing only – to quote Game of Thrones, ‘Winter is coming’. For us equestrians it means its time to start prepping the horses for winter, sorry to be the bearer of bad news here. How do we handle all of this then? Hopefully the following tips will make winter a little easier at the very least! Now is a good time to plan how you’re going to deal with turnout this winter. Temporary Electric fencing – Can turn that big paddock into smaller paddocks – this way you can rotate fields to make the ground last longer. Gateways – Do your gate entrances and walkways get poached the second winter starts? Leaving you wadding through six inches of mud to get to your horse. Dump some of your shaving from the muck heap in these areas. Even the dirty shavings will help to reduce the poaching, meaning no more losing your wellies. Before clipping your horse of their lovely warm coat, ensure that you have your rugs washed and ready before you’ve clipped. Remember that horses are much better at heating themselves up then cooling themselves down. Therefore, over-rugging can be potentially dangerous to your horse and can cause health issues for horses if they over heat too much. If in doubt, err on the side of caution and under-rug slightly. Below is a guide to help you choose the right rug. However, each horse is different, and you’ll know best to what your horses’ preferences are when it comes to rugging. For example, my mare Tilly, when clipped likes to be well rugged up but others might not. Therefore, the guide below is just that, a rough guide. Another good tip for rugs during the winter month is, have spares. Having two turn out rugs & two stable rugs means you can rotate the rugs if the first set get too wet. Keeping your horse warm and dry. Which is especially important if they are clipped. 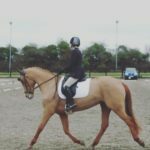 When choosing the right clip for your horse, you need to take into account the amount of work they’re going to be doing. There’s no point fully clipping out a horse that’s being turned away for the winter. For a horse that mainly hacks is better off with some hair being kept on their back. Follow this link to help you decide the right clip for your horse. Lastly, don’t clip unless you’ve an appropriate rug, putting a rain sheet on a freshly clipped horse in winter probably won’t be the most effective. Although feeding is normally dictated by the work load of the horse, some horses do need a little extra feeding if they are prone to lose condition when it’s cold. Hay is great for keeping them warm, a horse’s gut basically acts as a big radiator for them when digesting. Therefore, feeding hay ad lib may be beneficial to your horse this winter. Especially if they are used to being turned out 24/7 during the summer. Whereas if you’ve a hot horse that doesn’t handle being confined to their stable for long periods well, consider reducing their hard feed. For me the biggest problem with winter is mud fever. My horse Tilly gets extremely bad mud fever on her hand legs, to the extent that her hind legs closely resemble that of an elephant! What worked best with keeping it under control last year, was clipping her legs and using turnout boots. Clipping her legs meant that I was able to keep them cleaner and apply cream directly to her skin. The turnout boots where brilliant at keeping her legs clean and dry when out in the field. For most horses, the boots alone would be enough to prevent any mud fever. It’s advised to not leave turn out boots on for long periods of time. If you do have any concerns about mud fever or want to know some other ways on how to prevent it, get in contact with your vet. They’ll be able to advise you best. Another top tip from me would be to keep their tails plaited. This stops their tail becoming a knotted muddy mess which in turns keeps their hind legs cleaner. During winter there are no flies, so they don’t need a full tail to swat them away. Winter is probably the toughest time of year for any equestrian. It can feel like it’s never ending and no matter what you do the horses end up looking like mud monsters. But Autumn is the perfect time to prepare for those long winter months, giving you a fighting chance to reduce the amount of extra work you have to put in!